An essential part in keeping your lawn looking beautiful. Aeration & overseeding provide many benefits to the overall health and appearance of your lawn. Our Annual Fall Aeration and Overseeding service is highly beneficial when you are looking to enhance your lawn's appearance. 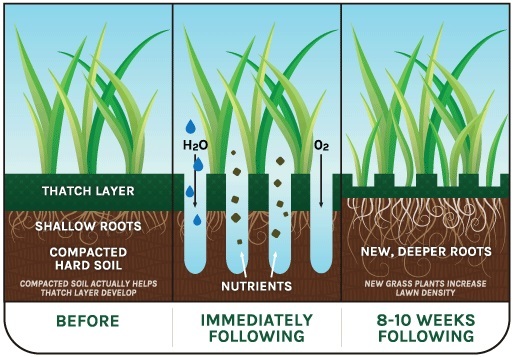 Aeration is the process of removing cores of soil from the lawn, allowing for improved infiltration of water and air into the soil, decreased soil compaction, along with strengthening the roots of the grass and stimulating germination of new seeds. Aeration is performed during the Fall months after the heat and humidity of the summer. Overseeding is a very important step to keeping your lawn looking it's best and is highly recommended at the time of Aeration. It is a vital step in keeping your lawn green and lush year round; doing so helps fill in sparse areas where grass has died off and reintroduces new species of grasses into your existing lawn to help strengthen it. The seed we use is a Custom Blend of Premium Tall Fescue grass specifically formulated for this region, and coated with a treatment of fertilizer to help give the seed the nurturance it needs at the time of germination, and reduces the time it takes to germinate into half. Prestige is here to help. We know your time is valuable and would be proud to assist you in keeping your property beautiful throughout the year. Our sales team is available to help and it would be our pleasure to work up a Free Quote any time you need it.